The BMB4 features an Ethernet port for 64 IO channels of Waves SoundGrid connectivity. 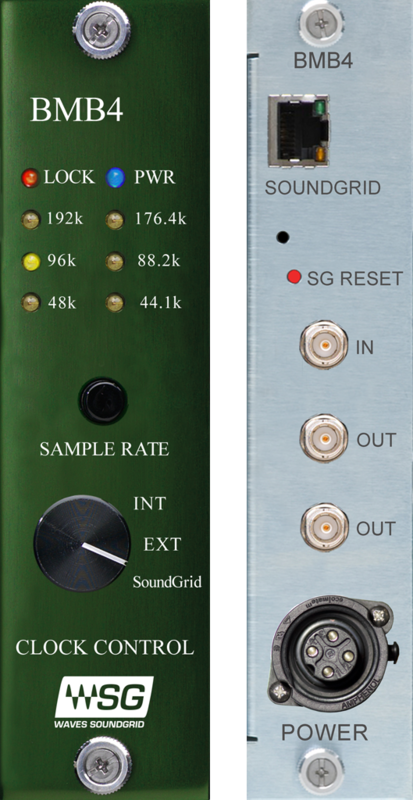 SoundGrid is an Audio-over-Ethernet networking and processing technology developed by Waves. SoundGrid provides extremely low-latency, high-channel-count audio processing using standard Intel CPUs and 1 Gbps Ethernet networks for studio, live sound, and other real-time professional audio applications. Real-time audio processing is performed on standard Intel-based plugin servers, running a Waves-customized real-time version of Linux. Waves SoundGrid audio over Ethernet technology is a robust, proven system for audio over IP networking. Amongst the competing standards for audio over IP, SoundGrid boasts impressive, low latency. With 6 BAD8s and 4 BDA8s a 48x32 IO can be achieved. With 2 BAD8s and 8 BDA8s a 16x64 IO can be achieved. With the configurability of the MOTHERHSHIP the IO possibilities are limitless.